Paris/London: Finance ministers and central bankers from the world’s top economies are set to back a mandatory capital surcharge on big lenders of up to 2.5% to be phased in from 2016. A draft communique from a meeting of G20 finance chiefs endorses a 1-2.5% capital surcharge on top banks like Goldman Sachs, HSBC, Deutsche Bank and JPMorgan Chase. A summit of the G20 leaders in Cannes, France in early November is set to give final approval to the surcharge plan and name the banks affected, known as global systemically important financial institution or G-SIFIs, G20 sources said. “Now that the framework applicable to G-SIFIs is agreed, we urge the Financial Stability Board to define the modalities to extend expeditiously the framework to all SIFIs," the draft communique obtained by Reuters said. Insurers are battling against a surcharge as second tier banks. The charge - which will be in addition to a 7% minimum core capital buffer being phased in for all banks from 2013 - is part of a wider package the G20 ministers are set to endorse on Saturday. The other elements include common “tools" for supervisors to wind up ailing banks, compulsory “living wills" or resolution plans for every big bank, and more intensive supervision for large lenders, the communique said. The FSB, which formulates and coordinates financial regulation on behalf of the G20, has already drawn up criteria to determine which banks face a surcharge. 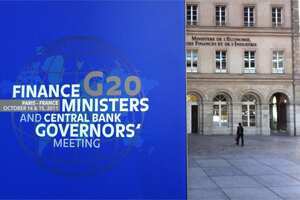 It has said 28 banks would be affected if the regime was introduced immediately but G20 sources said the Cannes summit may name up to 50 lenders. The FSB is also expected to update ministers on its work to define the so-called shadow banking sector before thrashing out recommendations next year to regulate it. Supervisors fear that as banks face tougher rules, risky activities could migrate to other parts of the financial system such as money market funds and special vehicles. G20 sources said the group was expected to approve a report from the International Organization of Securities Commissions, which groups national market watchdogs, on the benefit of imposing trading limits but it would remain “optional". The US Commodity Futures Trading Commission is set to discuss fixed limits on Tuesday but in Europe there is no consensus, with Britain opposed to such permanent curbs. Bank of Italy governor Mario Draghi is expected to propose strengthening the FSB, which he chairs, in order to ensure proper implementation of a welter of new rules the G20 has pledged to introduce, including the bank capital surcharge. Draghi, who steps down as chairman this month to become president of the European Central Bank, is expected to propose more members from emerging markets and developing countries on the FSB’s agenda-setting steering committee. Some Asian and Latin American countries feel the regulatory measures now being finalised plug supervisory holes in European and US markets and want their circumstances to shape future G20 regulatory work. Draghi also wants representatives of finance ministries on the steering committee to add political clout. “Draghi will also discuss the possibility to give FSB a legal personality and to allow it to receive resources from more diversified sources," a G20 source said. Saturday’s meeting will also touch on who will replace Draghi. Bank of Canada Governor Mark Carney is seen by some G20 officials as the main contender so far that the Cannes summit will endorse. G20 ministers are also expected to look at proposals to reinforce non-binding draft principles on financial consumer protection authored by the OECD which have been criticized for being too weak.